Bajaj Auto has launched the new V12 at Rs 56,283 (ex-Delhi). The V12 is the smaller sibling of the V15, and the two bikes differ in terms of equipment, dimensions and engine displacement. While the V15 uses a 150cc engine, the V12 uses a refreshed 125cc engine from the Bajaj family. The air-cooled, single-cylinder engine develops 10.7PS at 7,500rpm and 10.98Nm at 5,500rpm. More details about the state of tune and other aspects will be revealed when we ride the bike in a few days' time. Since the V12 sits below the V15, the V12 does not get the same kind of equipment. It gets 130mm drum brakes instead of the 240mm front disc from the V15. The tyres are also narrower at 2.75-18 up front and 100/90-16 at the rear. Both tyres are tube type. The V12's length is shorter than the V15, at 2,040mm by 4mm. Its height is also lower at 1,066mm, by 4mm. The styling is similar to the V15's which is one of its USPs. 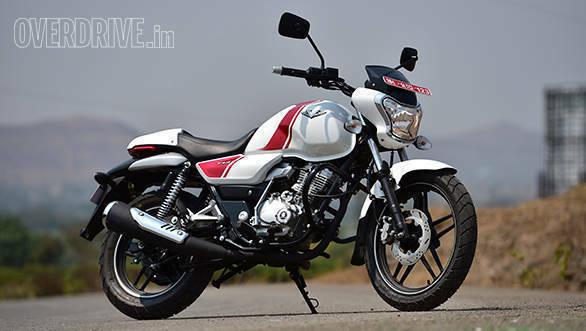 There's no other commuter motorcycle that looks like the V series by Bajaj. By launching a smaller displacement V, Bajaj is hoping to lure the kind of buyers who are looking for a blend of looks and 125cc fuel economy. The V15 was the first bike to bear the Bajaj V logo. The bike was built using scrap metal from the ex-Indian Navy aircraft carrier INS Vikrant. The idea behind the bike was to give Indians a chance to own a piece of history.